The City Performance Tool – CyPT is a dynamic simulation tool which studies a series of more than 70 technologies from Building, Transport and Energy Technologies – at different time periods and implementation rates. It is designed to reduce the environmental impact of everyday activities in any city. It covers greenhouse gas emissions from buildings and transport, as well as air pollutants such as particulate matter (PM) and nitrogen oxides (NOx). It also looks at the creation of new local jobs to install, operate and maintain city solutions. This versatile simulation tool can be used in many different decision-making scenarios. It can determine the implementation rate needed for your city to meet its future environmental targets. It can also measure the impacts of a city’s strategic plans, and compare traditional methods with state-of-the-art technologies for their benefits and value for money. CyPT takes city leaders beyond best practice technology solutions. It works from your city’s individual baseline to identify technologies to match specific needs. No need to follow the rest of the market: the CyPT approach empowers city leaders to focus on appropriate technologies that will provide win-win solutions for your unique urban challenges. CyPT identifies the exact technologies you need to improve and enhance your city for Buildings, Transport and Energy. The model calculates the environmental and economic impacts of individual technologies at different implementation levels. In transport, for example, CyPT assesses how a technology would reduce demand (reduce parking search traffic), shift the mode (public transport instead of cars) or improve efficiency (automated trains). The model is based on life cycle assessment methodology and builds upon Siemens’ technology expertise and global databases of deep vertical process knowledge. New jobs that would be created are based on reference projects or economic studies in the transport, building and energy sectors of different regions. 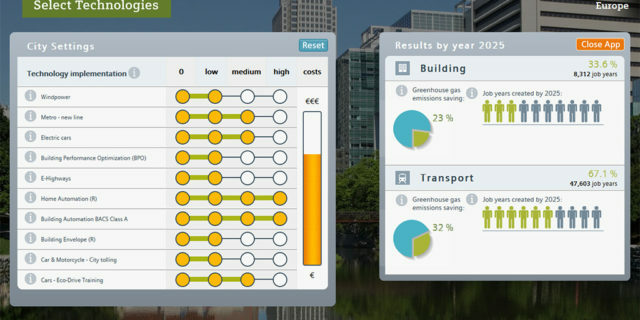 Three cities showcase the use of the City Performance Tool (CyPT) instrument for achieving policy and climate targets through changes in areas such as buildings, transport, or energy. Policymakers can select specific levers based on the goals they prioritize. The capital of Finland aims to become carbon-neutral by the middle of this century by switching to cleaner electricity and heating. Using CyPT, Helsinki and Siemens identified a number of technologies in the building sector that can deliver over 23 percent in citywide emission savings compared to business as usual. The total investment for these technologies stands at €1.9 billion, but in return, over €2.2 billion of energy savings will be delivered in a 15-year period; although this is a long payback period for investors, the city could look at setting up a warehousing loan facility to increase the total loan value for retrofits. Minneapolis, a metropolis of 404,000, adopted a Climate Action Plan in 2013 that identifies a roadmap for meeting its near-term 2025 goal of a 30 percent reduction in GHG emissions. CyPT modeling is being used to analyze the potential for meeting the even more stringent target of an 80 percent reduction in emissions by 2050 – and the analysis drawn from it may form the basis for updating the City’s Climate Action Plan in future years. Comprehensive analysis using the tool ultimately shows that 40 building and transportation technologies will have to be implemented and adopted at their highest implementation rates by 2050 to ensure that targets are met; a tough challenge. Minneapolis-based utility Xcel Energy already plans a move to 65 percent clean energy sources – a significant step toward achieving the city’s sustainability goals. Shenzhen, the coastal metropolis in southeast China that borders Hong Kong, was a modest town of fishing villages when it was declared the country’s first special economic zone in 1979. Four decades later, it is a technology hub known as China’s Silicon Valley with a population of over 10 million, a metro network of 131 stations, and the fastest-rising house prices in the world. The award-winning Shenzhen International Low-Carbon City (SILC) in the metropolis’s Longgang District is a comprehensive urban renewal project that aims to showcase China’s cutting-edge low-carbon technology, while serving the needs of local residents by upgrading existing buildings and factories to reduce their emissions. In 2014, the project clinched the prestigious annual City of the Future award from the Paulson Institute and the China Center for International Economic Exchanges. By applying CyPT, SILC aims to further clarify the concrete implementation plan for its low-carbon development target.